Why Ba Gia restaurant is special ? The most common local dishes in Cam Nam are banh dap (smashing rice paper), hen xuc banh trang (clams with crispy rice paper) and che bap (sweet corn soup). Banh Dap Ba Gia is the first restaurant in Cam Nam (Hoi An). The way you eat banh dap is to smash the rice paper, hence the translation "smashing rice paper". 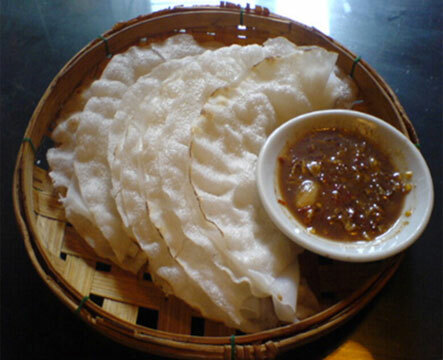 Banh dap is two pieces of crispy rice paper and wet rice paper (a close relative of banh cuon), combined together and smashed on the table. It's meant to be eaten in pieces then dipped into a bowl of sweet fermented fish sauce and chili called mam nem (my favorite). The sauce is made from fish that is sourced locally from Cua Dai Beach. Clams are fished from Hoai River, which runs through Cam Nam village, to make this special dish (photo above). The clams are boiled and then fried with herbs, onions, spring onions, chili, ginger and peanuts. The clams were tiny, fresh, and meaty. The herbs were fragrant and added in an extra depth of flavor. It was one of my favorite dishes in Hoi An. I've loved this dessert since I was a kid and the texture is fun to eat. Che bap is a sweet and sticky dessert made with shaved kernels of corn sourced from the village and sweet glutinous rice. It can be enjoyed at warm, cold or at room temperature. How to get to Ba Gia restaurant? You can walk over to Cam Nam Village, a bridge away from Hoi An's Old Quarter, to explore the local rustic food specialties of the area and we see a lane of restaurants that follow a beautiful tranquil river lined with starfruit trees.